In a blog written for his fellow kayakers, Chartered Physiotherapist Eoin O Conaire talks about the benefits of the Pad-ilates programme. I have been running the Pad-ilates programme now for four years. 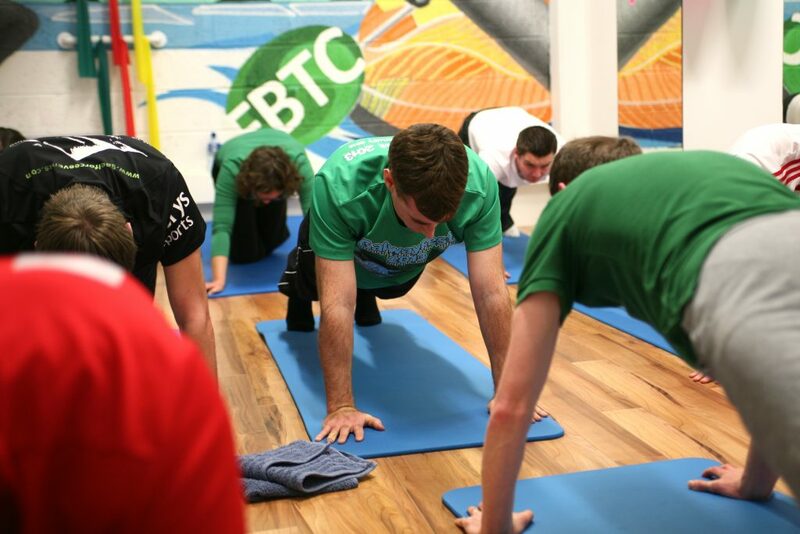 This is a weekly exercise programme which uses the principles of yoga, Pilates and therapeutic exercise and is tailored to the specific requirements of kayakers. There is plenty of information available here about the programme but I thought I would give a quick overview of some of the reasons why you might want to consider joining (or rejoining) the programme. A survey of paddlers that I carried out in 2014, revealed that 58% of respondents suffered from numbness, pins and needles or cramping in the legs when paddling. You can read all about my injury survey here. Thankfully in the vast majority of cases, these symptoms can be treated very effectively with exercises. In fact, an audit of Pad-ilates attendees, demonstrated that 100% of those who suffered from numb legs when paddling either had full resolution or improvement of their symptoms. If you suffer from this problem you can read my blog on this subject for more information. There are a number of ways that the exercises in the Pad-ilates programme can help improve your paddling efficiency. Probably the most notable one is that by improving core stability you improve the ability of your trunk and shoulder girdle to provide a solid base for your arms to move from. In other words by improving your ability to keep your trunk in an upright and neutral posture, we allow our propulsive muscles to work most efficiently to move us forward. Other ways that Pad-ilates helps with paddling efficiency is improvement of flexibility, posture, comfort when paddling and simply increased exercise tolerance. On those dark evenings when you can’t get out paddling, it is good to have a weekly exercise programme to attend. Sure, we all like a bit of Netflix and couch-time in front of a warm fire…but not every night! Having a weekly commitment (that you have paid for in advance) is a great way to help the motivation to keep your exercise going through the dark months. No this doesn’t refer to the fact that Pad-ilates prices are super good value and frozen at 2013 rates. I’m talking about flexibility! Roughly half of all of the participants in my Pad-ilates classes have flexibility issues. Most commonly the hamstrings, calf muscles and hip flexors are affected but thoracic spine (mid-back) and pectorals are often a problem too. A dedicated flexibility programme to address these restrictions not only helps with paddling but also with reducing pain, discomfort or injury in everyday life. The other main group of people that attend the classes are those who have absolutely no problems with flexibility but because of hypermobilie ligaments have difficulties with core stability and trunk strength. If you are hypermobile you will have no problem touching your toes but will struggle with exercises like “Plank”, “Side-Plank” and “Press-ups” and the numerous other difficult variations of these that I spend my time dreaming up. At Pad-ilates we spend a lot of time improving technique and form on these exercises which ultimately leads to improved core stability, better paddling performance and reduced pain or injury risk. I’m not being ageist here (having passed this particular milestone a few years ago myself). However research has consistently shown that we lose approximately 1% muscle mass per year from the age of 40. In addition we lose elasticity in our ligaments and muscles (and lung tissue and blood vessels and skin!). All of this means that we have an increased risk of pain and injury. You might not notice 3% loss of muscle mass at 43, but you certainly notice 15% loss at 55 years. A dedicated strength and conditioning programme can help counteract these aging effects. Pad-ilates provides a structured programme devised and closely supervised by a chartered physiotherapist. This is a controversial one because research has shown that exercise programmes are not very effective in weight-management. A recent editorial in the British Journal of Sports Medicine outlines this point with the subheading “you cannot outrun a bad diet”. You can read this brief but brilliant and hard-hitting article here. No matter how much exercise you do, if you not eating the correct amount and type of calories, you will not lose weight. Pad-ilates is not a weight management programme but because it includes a component of high intensity interval training, it can certainly help with weight reduction. In addition, the core stability exercises will improve muscle tone – particularly in the trunk. Just don’t go to Supermacs on the way home! A few years ago the phrase “sitting is the new smoking” was popularised after the publication of a number of studies showing the link between prolonged sitting and chronic diseases such as cardiovascular problems and diabetes. A team of international experts have shown that the harmful effects of sitting for eight hours per day can be reversed by carrying out one hour of exercise per day. Pad-ilates gives you one of these hours. Other suggestions are to actively commute – walk, run, cycle to and from work or to use your lunch break to get to the gym, have a walk or take a yoga class. Aside from the systemic effects of prolonged sitting, in my everyday practice as a physiotherapist, I see the musculoskeletal consequences of sitting in a flexed posture for long periods. There are a huge range of issues but some of the most common are: tight hamstrings and hip flexors which can contribute to low back pain, and a slumped and forward head posture – looking at that computer screen – which is associated with neck pain, headaches and arm pain. Pad-ilates helps to address these muscle imbalances, re-educates posture and is the all round antidote to sitting. Pad-ilates is relaxed and fun and gets you out of the house on those dark winter evenings. There is a sense of camaraderie about attending a group exercise programme. Everyone is working together to make improvements over the eight weeks. We all have different areas that we find easy or hard and all have different but equally satisfying achievements as we notice improvements over the weeks. There is a sense of virtuousness that you get from dedicating an hour of your time to improving strength, stability, flexibility and overall fitness. This sense of well-being together with the feel-good neurotransmitters that get released by our brains and spinal cords when we exercise means that attending Pad-ialtes is a good buzz!